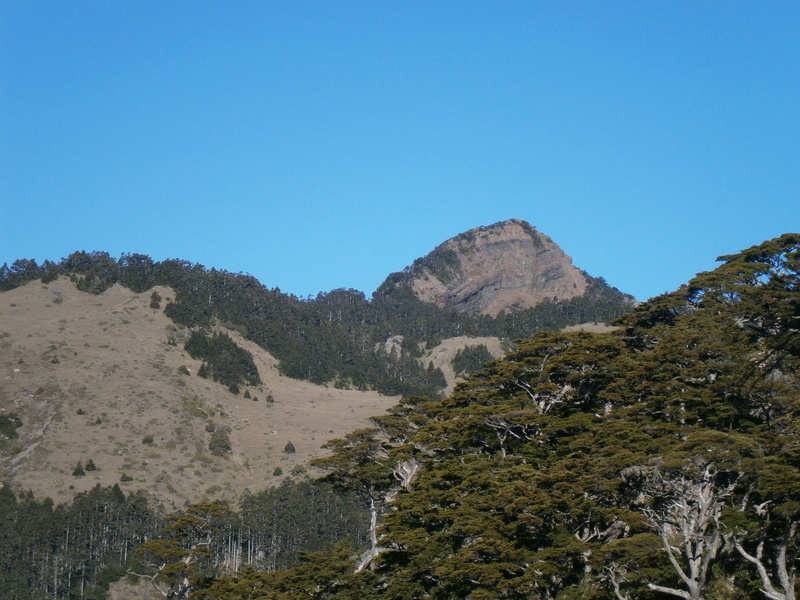 The Sixiu ridge. 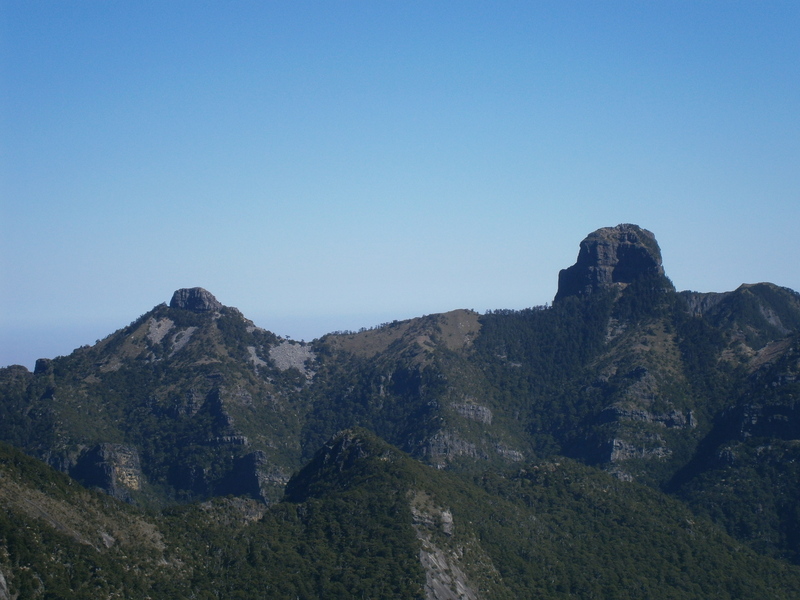 Visible from left to right are Pintian Shan (3524m), Chiyou Shan (3303m), and Tao Shan (3325m). 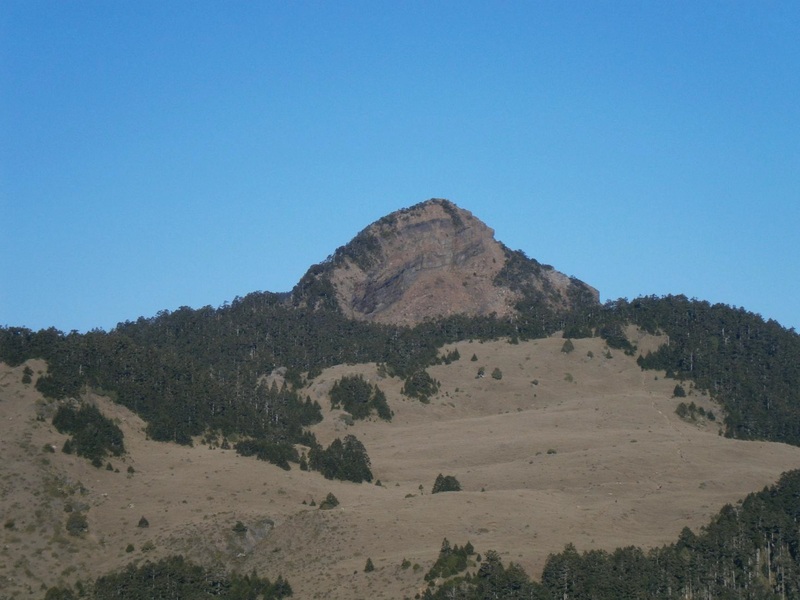 Kelaye Shan (3133m) is located north-east of Tao Shan, and thus is not visible. Photo from my 2010 Snow Mountain trip. 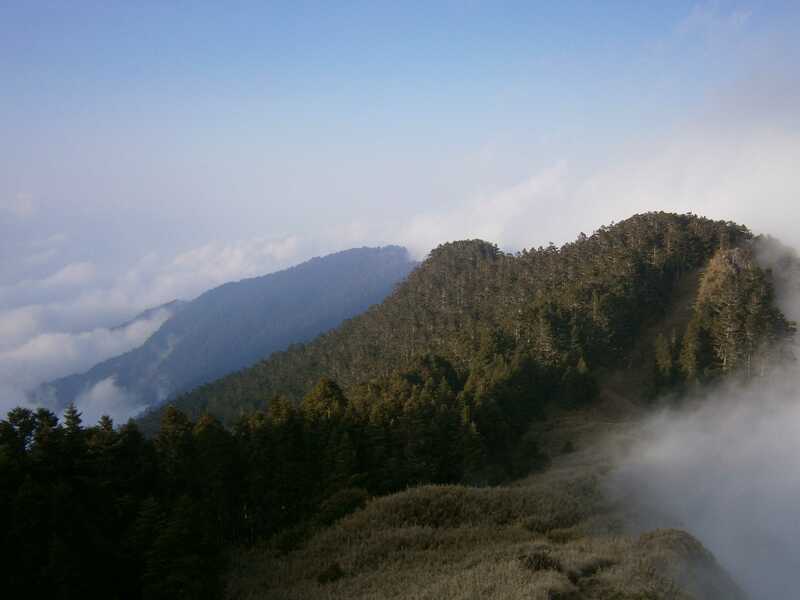 Taiwan’s Snow Mountain range is one of Taiwan’s most beautiful, and in good weather has some absolutely stunning landscapes. 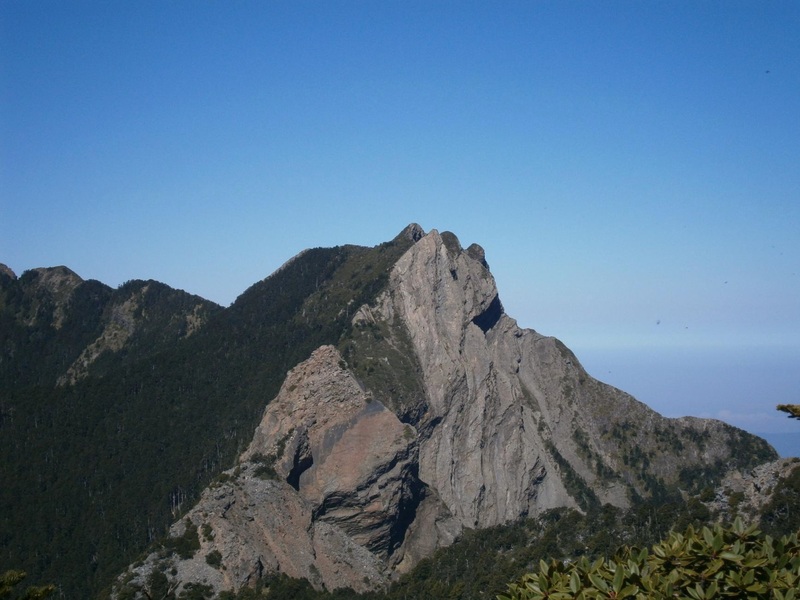 The Wuling Sixiu (“four shows”) are a set of four 3000+ meter mountains – Pintian Shan (3524m), Chiyou Shan (3303m), Tao Shan (3325m), and Kelaye Shan (3133m) – located on a ridge east of Snow Mountain, so named due to their prominence and visibility from the Wuling Farm recreational area. We set off to climb all four of them over three days, with two nights spent camping on the ridge. 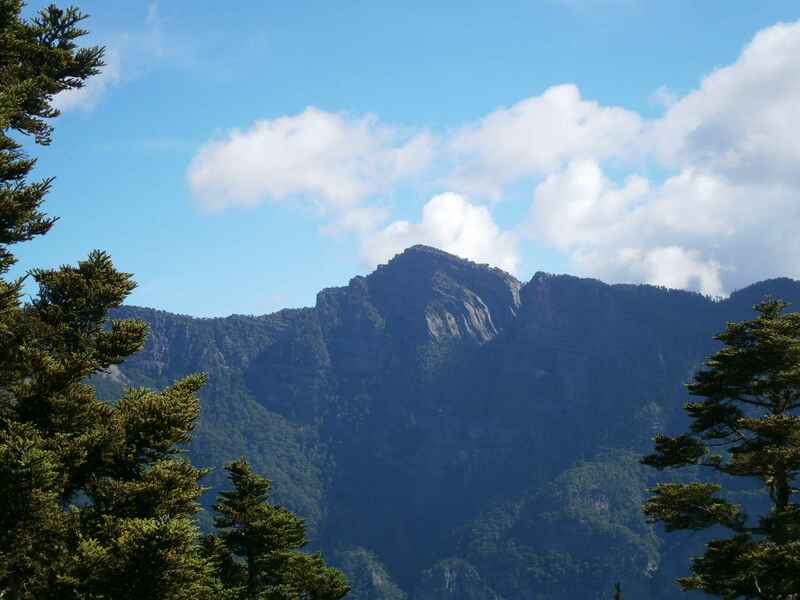 A view of Pintian Shan from the eastern Snow Mountain trail. 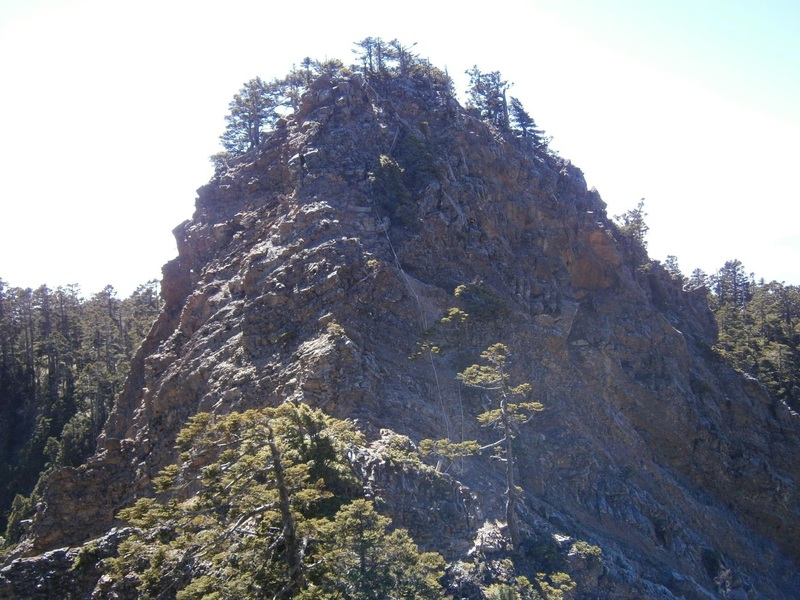 Photo taken on my 2012 Snow Mountain North hike. The route involves some awesome terrain: hemlock forests, sheer cliffs, and alpine meadows. We had great weather for all three days, and enjoyed scenic views of surrounding mountains throughout the trip. Day 1: Our bus departed Taipei at 7:30 a.m., arrived at Wuling farm around 11:30. 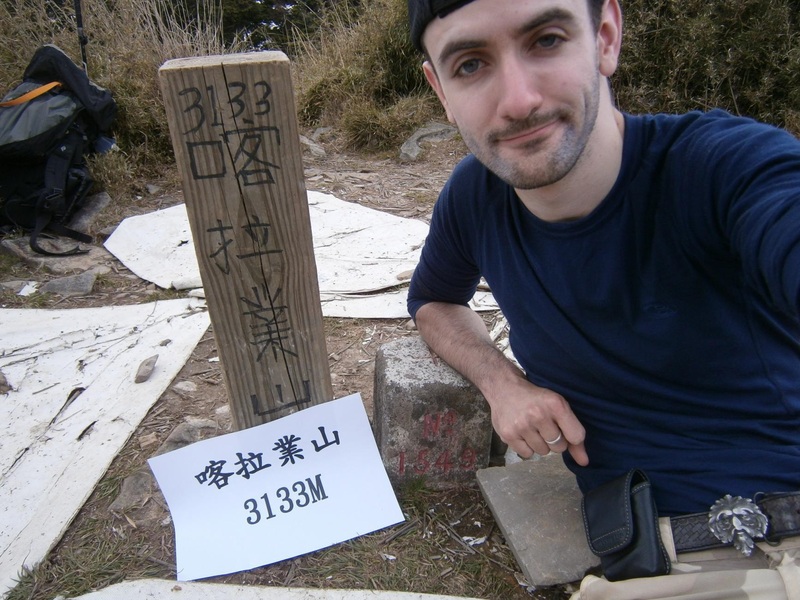 We hitched a ride to the trailhead, and began to climb the 3.5km Chiyou trail to our campsite. We arrived around 4 p.m., pitched tent, and headed towards Xinda cabin to get water. The water run was a much longer mission than expected, and took us a solid ~4 hours round trip, longer due to rough terrain in darkness, and a few short stretches of being lost. 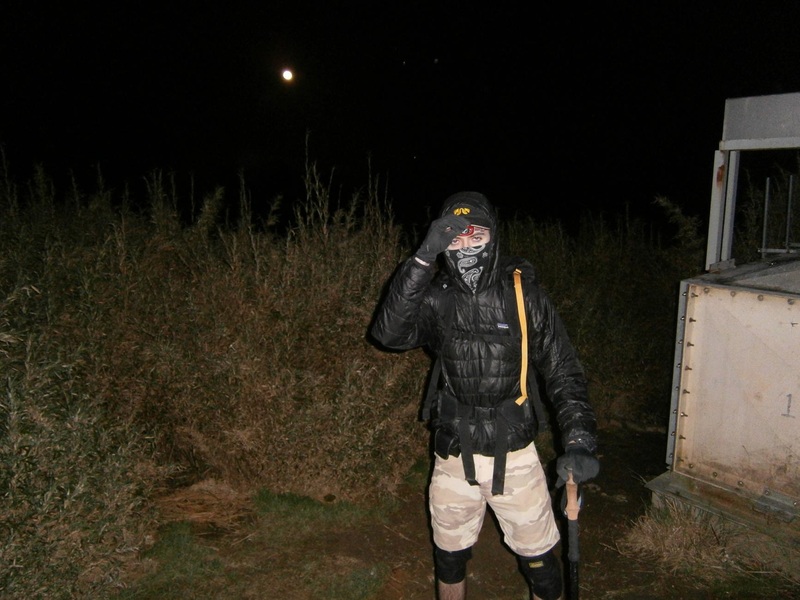 We were lucky; the moon was startlingly full, the sky was clear, and the stars were brilliant. Our campsite. Very comfortable, but no water source. Finally at Xinda cabin, where we picked up a good 10L of water. Feeling tired, but we still had to carry it all back to camp! Day 2: Up at 5 a.m., on the 3.1km trail to Pintian Shan by 6. 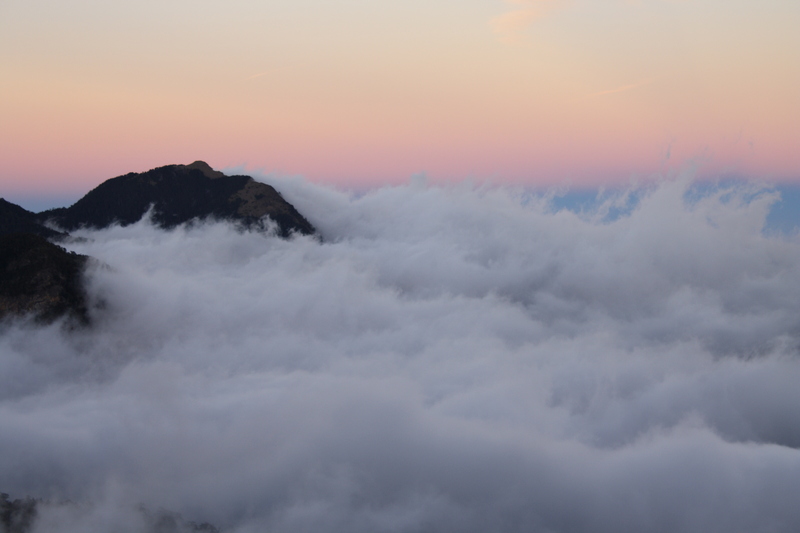 We reached 3303m Chiyou Shan at 6:15, and stopped to take photographs of the scenery. The sky was blue and very clear, affording good views of the surrounding mountains. The view from Chiyou Shan was impressive. Snow Mountain to the left, Snow Mountain’s North Peak and Pintian Shan to the right. 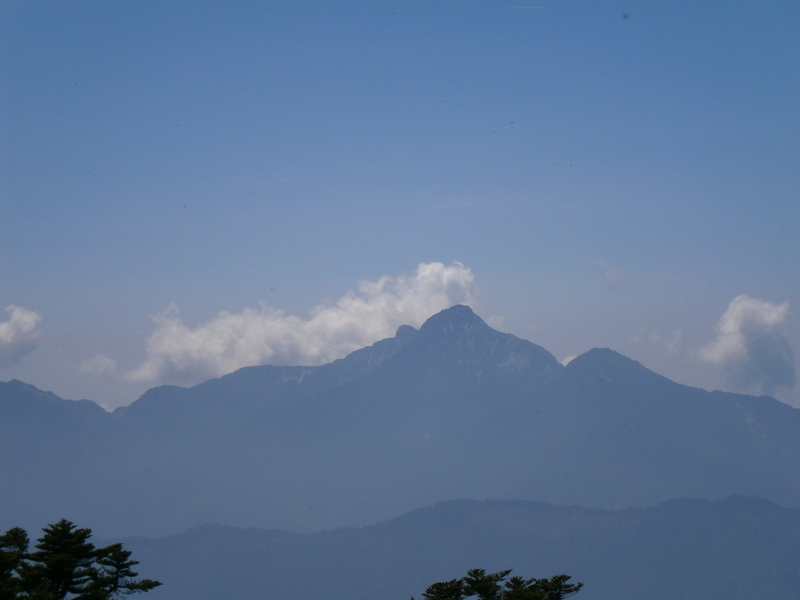 A close up of Snow Mountain, as seen from Chiyou Shan. The main peak of Snow is the soft, broad ridge to the left. 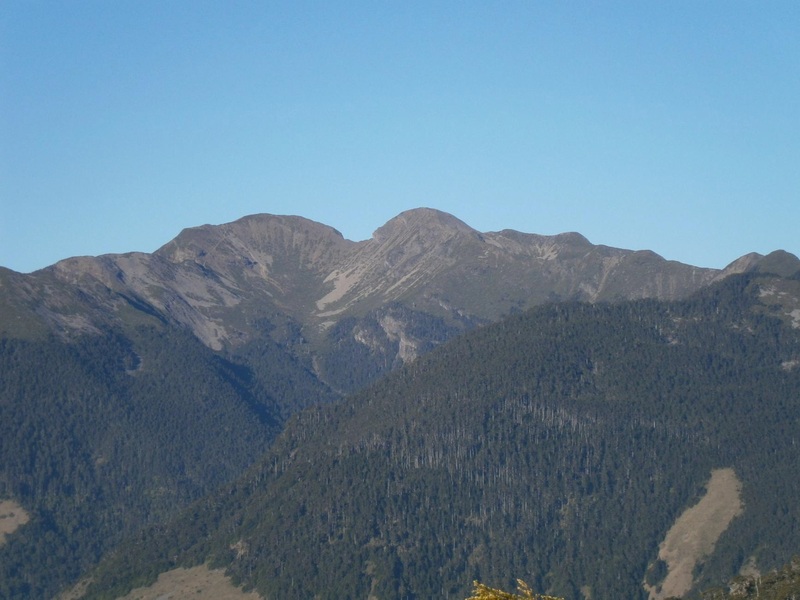 The more prominent right-hand ridge is the north shoulder. The trail up to the top of the main peak is visible. Mighty Zhongyangjian Shan’s prominent pyramid towered in the distance, and this day’s constant views of it amplified my desire to climb it. Zhongyangjian Shan in the distance. From Chiyou Shan, we headed to Pintian Shan. Pintian Shan in the distance. A good view of Tao Shan and Chiyou Shan, on the way to Pintian Shan. 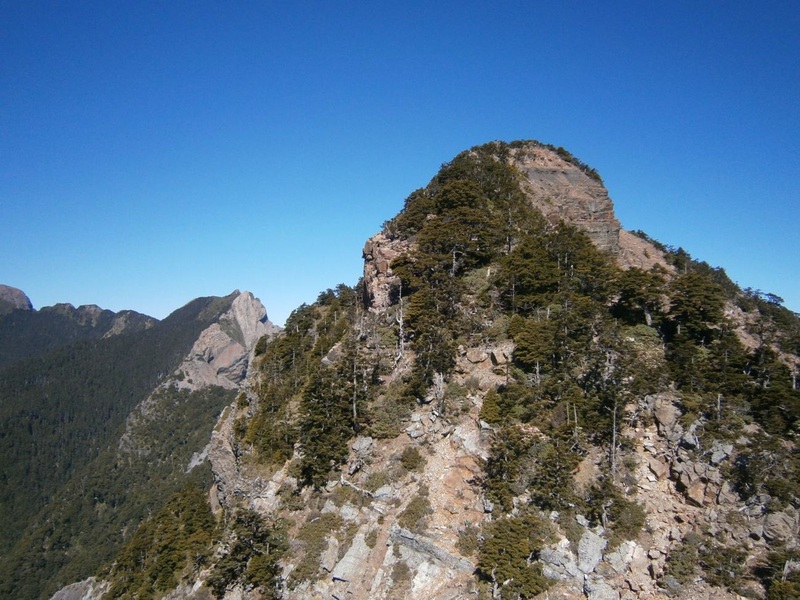 Chiyou Shan is the closer mountain, Tao Shan is the grass-covered peak behind it. 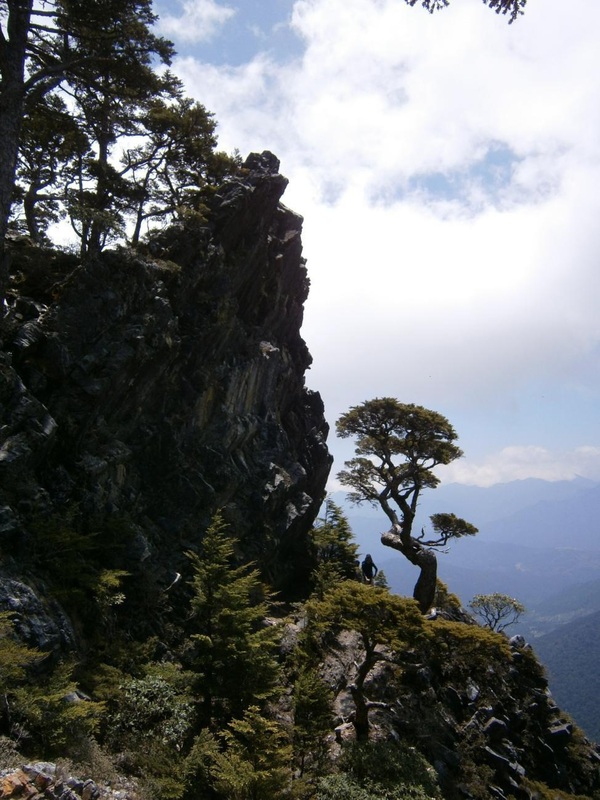 To get to Pintian Shan, you need to go up and down a steep cliff. It is a lot easier than it looks. At the base of Pintian Shan. We arrived at the top of 3524m Pintian Shan around 9:30 a.m. Pintian Shan overlooks the holy ridge, and more great views were had. Mutelebu Shan was particularly ominous looking. Dabajian Shan and Xiaobajian Shan were clearly visible from the top. Xiaobajian Shan and Dabajian Shan. Mutelebu Shan was particularly eye catching. Stunning Scenery – on the way back to camp from Pintian Shan. From Pintian Shan, we returned to our campsite, arriving at around 12:00. 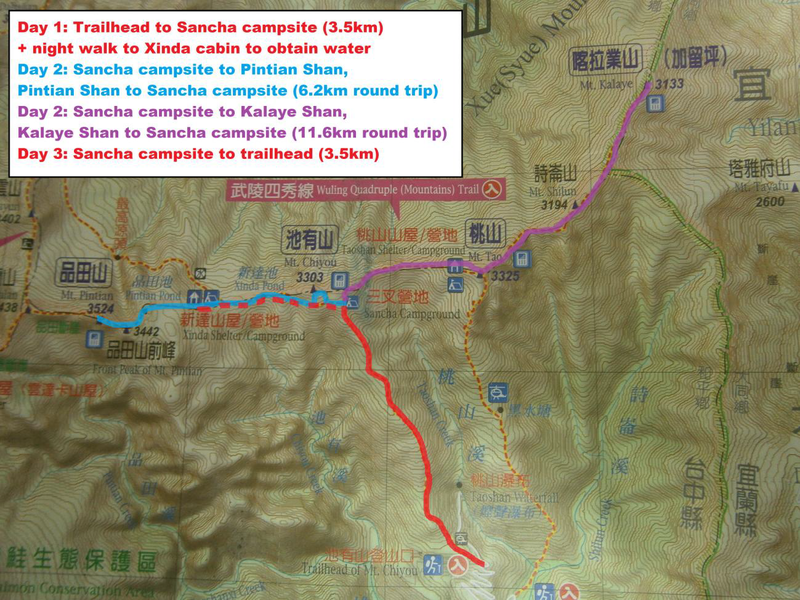 We cooked up a hot lunch, and I departed for Tao Shan, 2.3km away, at 12:45. 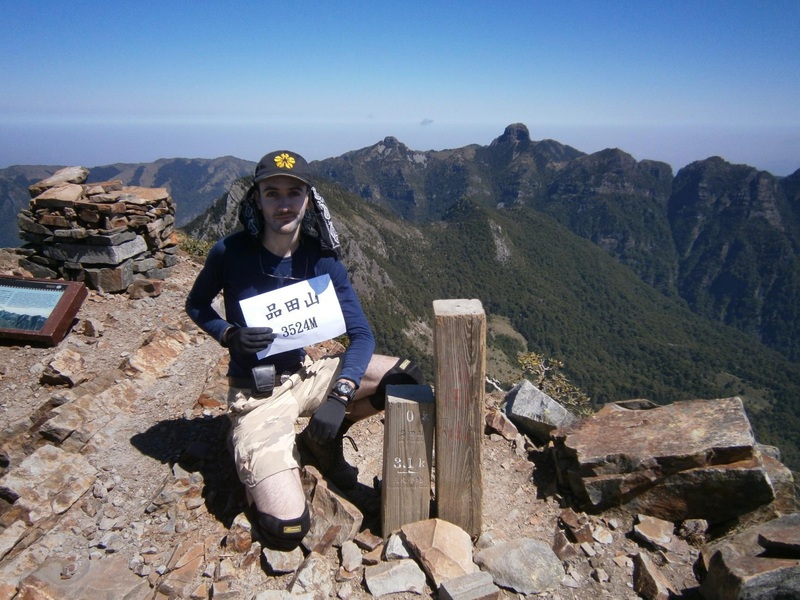 Unsure what the trail terrain would be like and conscious of the time, I arrived at the top of 3325m Taoshan at around 1:50. Tao Shan in the distance. This photo was taken during my December 2010 Snow Mountain trip. 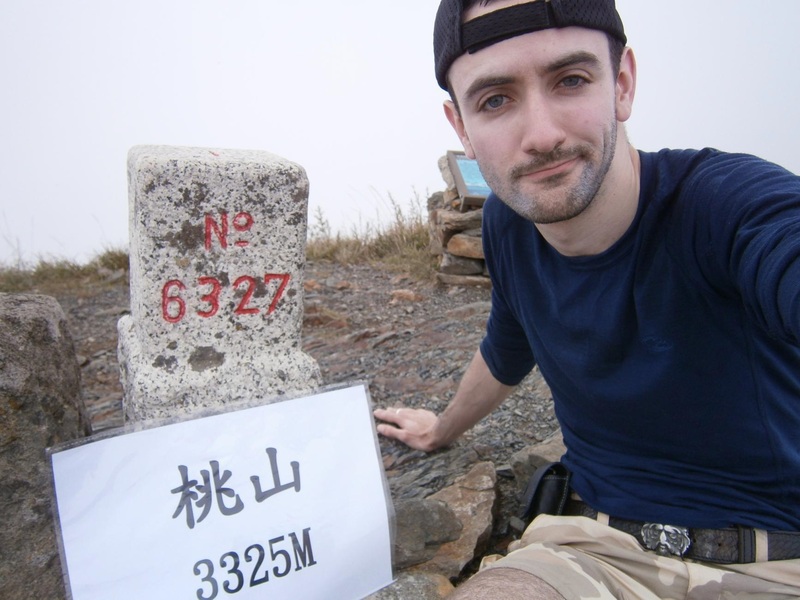 The clouds rolled in after lunch, and I burned off to Taoshan. With daylight limited, I practically ran there. 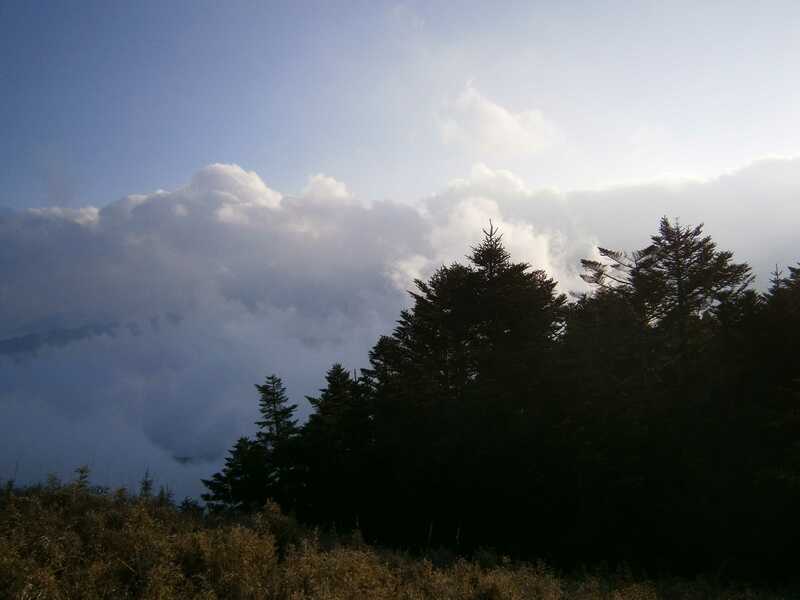 From Taoshan, the trail dropped, and continued up and down another 3.5km through pine trees and thick Yushan cane to 3133m tree-covered Kalaye Shan, where I arrived at around 3:45 p.m. 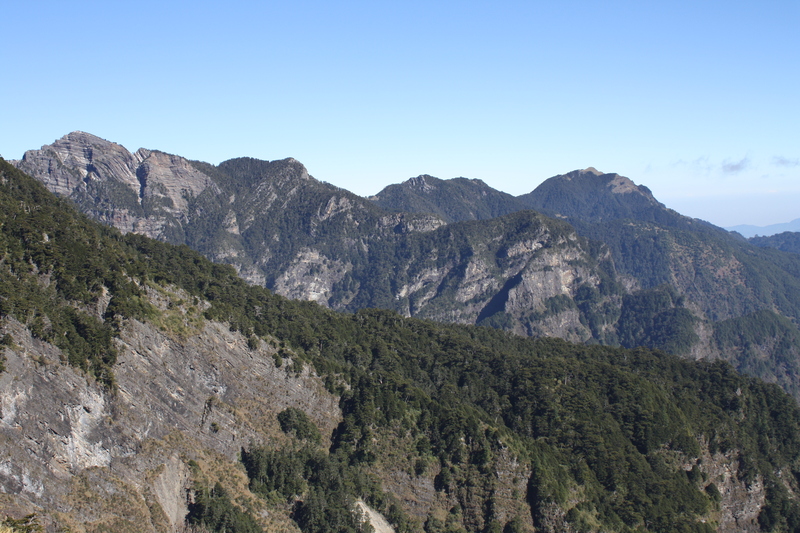 Looking back at Tao Shan, from the Kalaye Shan trail. Heading back, I arrived at our campsite around 7:15 p.m. – a long ~12 hour day of hiking. Tree-covered Kalaye Shan in the distance. 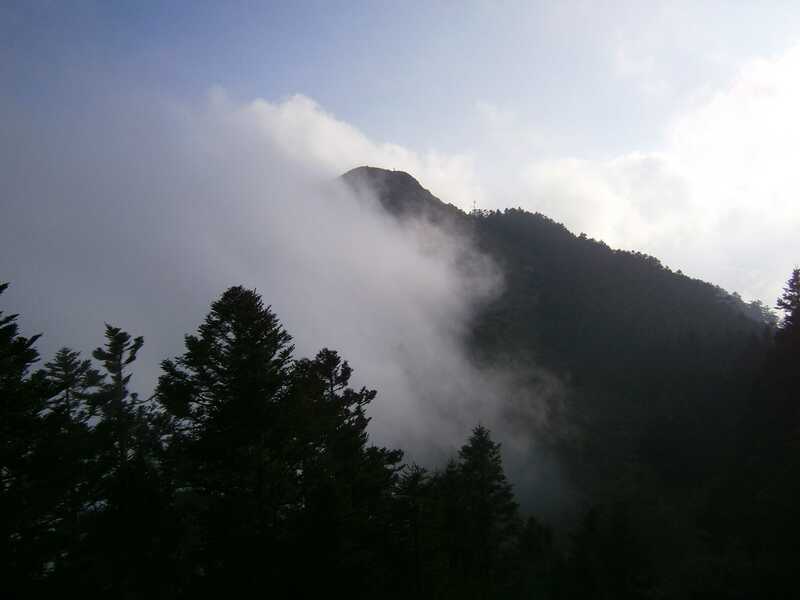 Clouds moving in on the way to Kalaye Shan. 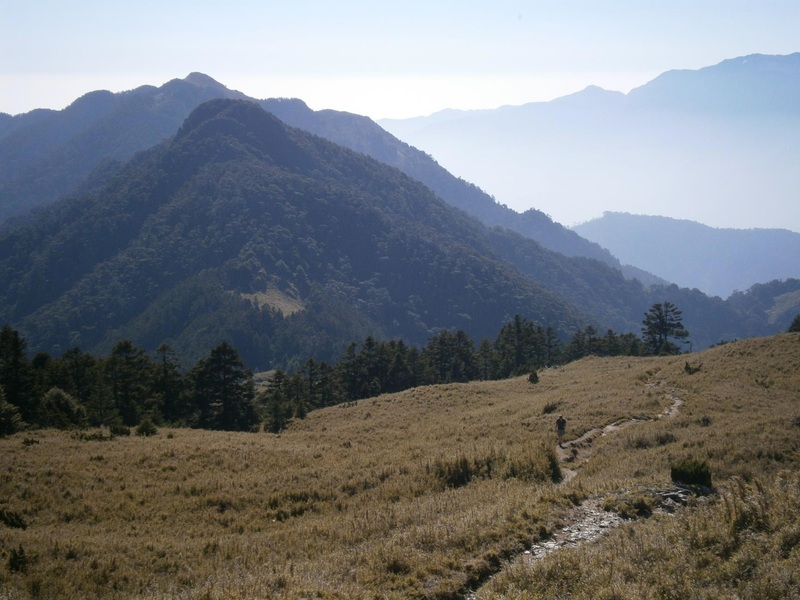 The 3.5km trail to Kelaye Shan goes both up and down hill, through dense Yushan cane. 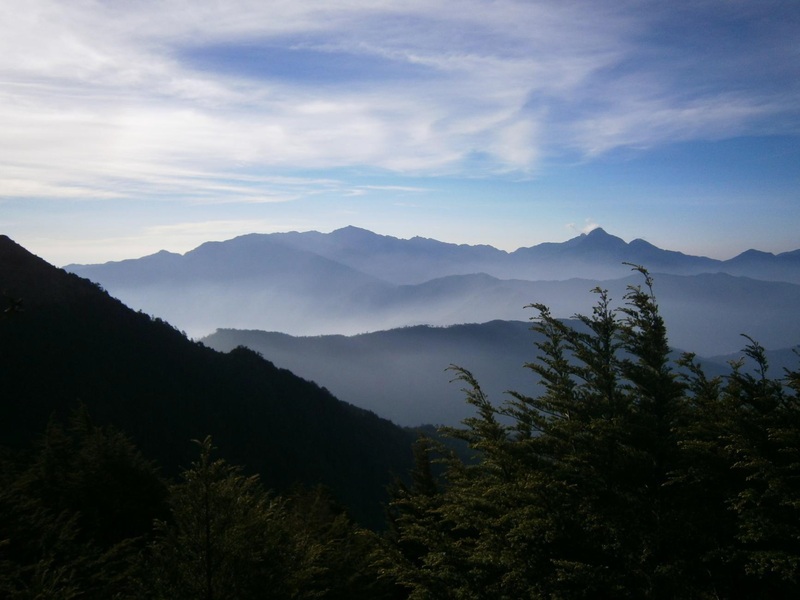 A wonderful view of Nanhudashan (the highest peak to the left) and Zhongyangjianshan (the prominent peak to the right) presented itself. Day 3: Up at 6 a.m., on the way down around 8 a.m. We arrived at Wuling Villa around 11:45, and were able to hitch a ride back to the visitor center within minutes. Our bus arrived at 2 p.m. to take us back to Taipei. We chose to camp, but there are two mountain cabins (Xinda cabin and Tao cabin) on the ridge which make the route more accessible. See the map up top. 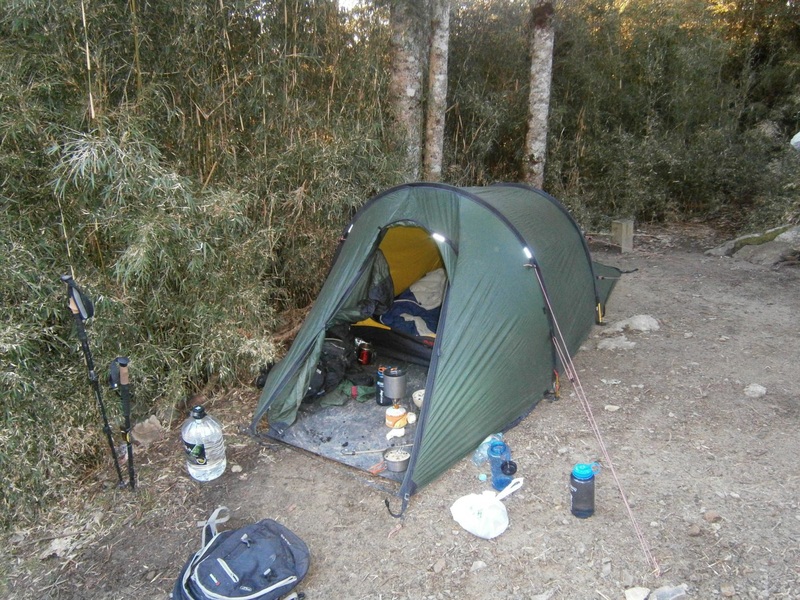 For camping, there are quite a number of spots large enough and sheltered enough to pitch comfortably. Our campsite, the Sancha site, would comfortably fit two tents. 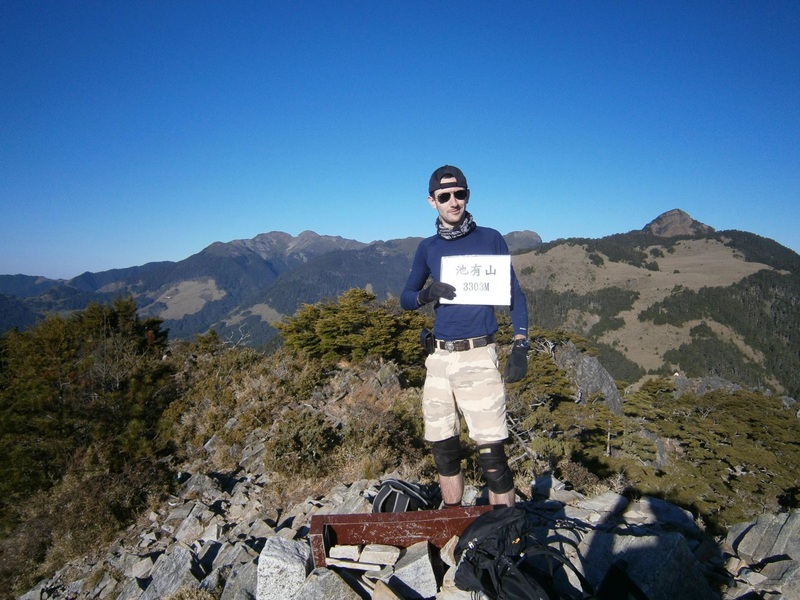 This entry was posted in Hiking, Shei-Pa National Park (Snow Mountain) - 雪霸國家公園, Taiwan - 台灣 and tagged Chiyou Shan, Kalaye Shan, Pintian Shan, Taiwan Hiking, Tao Shan, Wuling Quadruple, Wuling Sixiu, 品田山, 喀拉業山, 桃山, 武陵四秀, 池有山 by Ian. Bookmark the permalink.